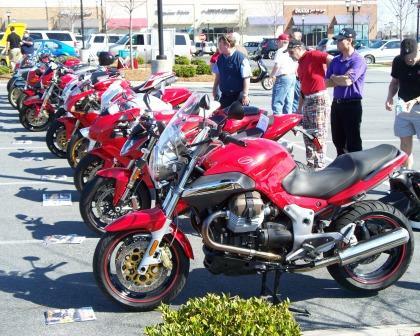 An unexpected benefit of being a Moto Guzzi owner was being able to participate in the annual Motori Italiani show in Charlotte, NC. The event, described as “a celebration of Italian motoring”, was held on March 20th, 2010. The Charlotte Area Ferrari Enthusiasts (CAFE) with help from Foreign Cars Italia, Lamborghini Carolinas and Vespa of Charlotte put on an eye-popping gathering of vehicles. Thank you to Kevin of CAFE. The popular local restaurant 131 Main was the host this year. 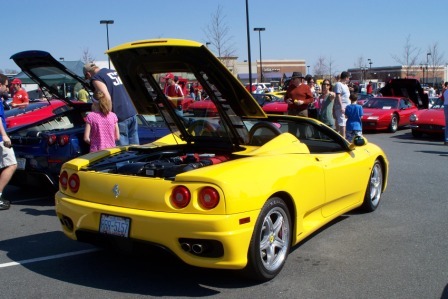 Their parking lot at Blakeney served as a perfect setting for what I’d estimate held more than $2 million worth of Ferraris, Lamborghinis, Maseratis and more on display. The outdoor patio was packed. Thanks to 131 Main for providing the gift cards to us participants and for hosting this gathering. Among the motorcycles featured in this years Motori Italiani event were several Ducatis, most of which were members representing the US DESMO Ducati club. 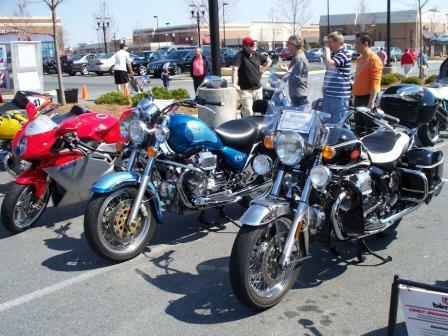 There were a handful of us with our Moto Guzzi Californias, including Frank with his nice blue/blue V11, a white EV, and my black ’07 California Vintage. My friend Jim had his ’06 Breva 110o, and there was a racy red V11 LeMans there too. 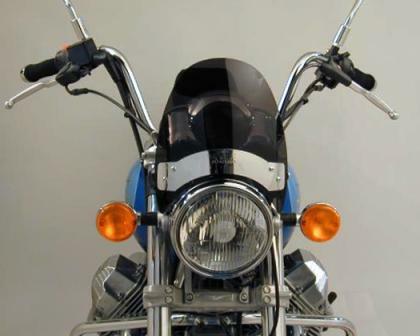 Other fine Italian motorcycles included the motorcycle class winning ’06 MV Agusta 1000, a vintage ’73 Laverda 750, a very interesting Ducati-powered ’97 Bimota db3, and an ’03 Aprilia Mille R Haga Edition. Fortunately, the weather was perfect after a one of the coldest and perhaps wettest winters we have had in Charlotte in many years. 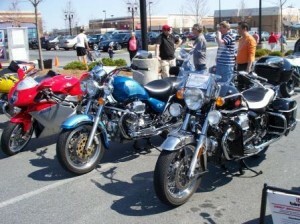 Like a fool, I ended up with a bad sunburn, but had a great time enjoying all the cars, motorcycles, and conversation. In retrospect, maybe I should have removed my Givi top case. Even though I thoroughly enjoy the top case, I do think it might be a little scooter-ish looking on my California. I kept it on since Givi is Italian and felt it was a good match for the show anyway. My Moto Guzzi California motorcycle didn’t win any of the judging, but I was happy just to be there and to have met a lot of nice folks that appreciated the cars and bikes as much as I did. 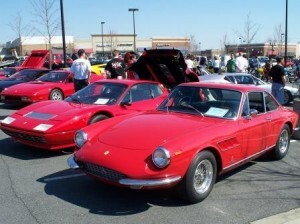 Mike and all: The 2011 Motori Italiani event in Charlotte, NC will be held on Saturday, March 26th again at 131 Main Restaurant. Rain date is Saturday, April 2nd. Let’s all try to get a lot of Guzzis in this show this year! Contact me for more info if interested to enter. What is the date of this event in 2011?